1. Who or what is Handwerkerkaution.ch? Handwerkerkaution.ch is an online platform that helps companies who need to fulfil their deposit obligation, while providing services in Switzerland. Handwerkerkaution.ch provides a cheap and easy solution, offering a sensible alternative to: cash deposits, bank guarantees or other expensive credit solutions. 2. What is an insurance deposit? An insurance deposit is an insurance policy that meets the deposit scheme in Swiss collective agreements. It is equivalent to the level of safety and protection of a cash deposit or a bank guarantee by a Joint Commission. The deposit insurance is backed by the Helvetia Insurance Basel / St.Gallen. 3. Who benefits from an insurance deposit? Companies and Joint Commissions benefit equally. With our solution, we use a combination of simplicity, entrepreneurs and reliability. Our insurance deposit provides a legally compliant product, with ambiguity in the retrieval procedures presented. Helvetia Insurance carefully performs credit checks of their applicants; therefore it provides all parties with an additional degree of safety. 4. What are the advantages of insurance deposits versus cash deposits? With an insurance deposit, the financial flexibility is maintained, while the cash is still available. 5. What are the guaranteed benefits of an insurance deposit submitted to the bank? 6. 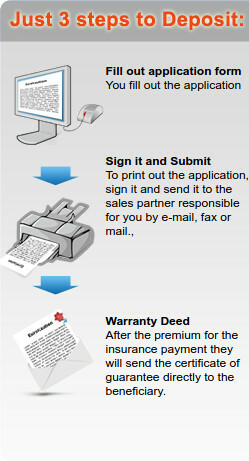 Why is a warranty certificate required? The certificate insures both the applicant (the company) and the Joint Commission (occurrence of the insured event) that the latter’s first request receives the guaranteed sum from the insurance company. 7. What happens to the applicants data? One of our top priorities is maximum data protection. Applicant’s data is exclusively used for the completion of the insurance deposit. Therefore, the application form will be sent directly to the Helvetia Insurance by the sales representative that is responsible for you. 8. How much is the premium for an insurance deposit? The premium (including the 5% federal stamp duty) for an insurance deposit depends on the amount of the deposit per year: CHF 210.00, CHF 341.25, CHF 393.75 or CHF 446.25. For an individual premium calculation, there is a free premium calculator on our website. 9. When are premiums and stamp duties considered overdue? The annual premium (including stamp duty tax) for the insurance deposit is due when your application is approved. Once approved, you will receive the insurance policy with the premium invoice. Once your premium payment is received by the Helvetia Insurance, the warranty certificate is delivered to the Joint Commission. 10. How can I apply for an insurance deposit? Fill out our „Request Form“ and our „Information on Fiscal Year Results“ form completely. Send the completed and signed forms via e-mail, fax or letter to the distributor. After a full examination of the insurance policy and the premium account, you will receive your results from the Helvetia Insurance. Upon receiving the receipt of the annual premium, Helvetia Insurance will send the warranty package to the Joint Commission. 11. Where do I send the signed application form ? 12. Is there a limit on the deposited amount? No, generally not. Collective agreements with a deposit scheme currently provides for a maximum amount of CHF 20,000. If requested in advance, larger deposit amounts may also be placed. 13. Is there a minimum period for the deposit insurance? Our insurance deposit term is two years (starting with the date of issue of the warranty certificate). Thus, the contractual relationship is terminated. There are no additional costs. Of course, you can always extend further your insurance deposit. Note: Under certain circumstances, the security deposit must be renewed to continue providing security. So it is up to you to renew the deposit protection in time or maintain it. 14. What requirements must be met by the applicant? The applicant needs: the submission of the signed application form (including the „Information on the Fiscal Year Results“ form) and the credit assessment of the Helvetia Insurance with positive results. 15. When can I cancel the contract? The insurer who filed an application for an insurance policy has a deadline of 14 days after the contract was received. The period begins when the application has been submitted by the insurer or its agent (distributor) to process. The applicant shall be exempt if the declaration of acceptance by the insurer has not arrived before the expiry period (Article 1 of the Federal Law on Insurance Contracts). 16. Who is the Insurer? Helvetia Insurance is the insurer and thus guarantor. Financial obligations are not covered by Handwerkerkaution.ch, but exclusively from our financially strong insurance partner. 17. Who is the Helvetia Insurance? Versicherungsgeber und damit Garantiesteller ist die Helvetia Versicherungen. Die finanziellen Verpflichtungen werden nicht von Handwerkerkaution.ch übernommen, sondern ausschliesslich von unserem finanzstarken Versicherungspartner. 18. Wer ist die Helvetia Versicherung? Helvetia Insurance is a quality-oriented insurance company with over 150 years of experience. It is one of the leading insurance companies in Switzerland. More than 750,000 customers are served by 35 general agencies and around 2,500 employees. Whether applying for personal or occupational pension, life insurance or mortgage: With a comprehensive range of products, Helvetia provides coverage from one source – for individuals and for SMEs. Helvetia Insurance Switzerland is part of a strong group, which also operates in Germany, Italy, Spain, Austria and France.